Will Rdio kill the Spotify star? The UK is finally getting a taste of the Rdio social music-streaming action as the Spotify rival has arrived on our fair shores. 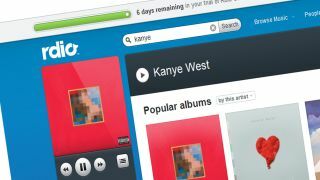 The popular A-phobic music-streaming service is very similar to Spotify, but gives you the option of working through your web browser as well as downloading a desktop app – it's a little like Deezer in that respect. The subscription model is the same though – you're looking at £4.99 a month for unlimited music streamed through a desktop, and £9.99 if you want to make use of the mobile apps (for Android, Windows Phone, BlackBerry and iOS) and wireless streaming to Sonos and Roku hardware. Of course you can link your new Rdio account to Facebook, Twitter and Last.fm, and there's a more social element allowing you to 'follow' other users so you can perv over their music choices and share playlists. Looking at the catalogue available on Rdio at launch, we wouldn't say that warning bells will be ringing at Spotify's London HQ just yet. The catalogue is quite limited compared to what's available on the US version despite Rdio's deal with PRS for Music. But it's early days for the UK service and this will likely grow - most major artists seem to have at least some albums available, so if that's your bag then you'll probably be happy. If you're already using Spotify, we're not sure it'll tempt you into changing service, especially given that there's no way to import your playlists and social connections. Still, it's worth a look at the seven-day free trial to decide if it's the music-streaming service for you or not. The mobile apps are available through the Android, Apple, BlackBerry and Windows Phone app stores, and you can sign up at Rdio.com.